I always wondered how people run for so long at a spring in mass of thousands. How it feels like being inside the mass, running for cause, for corporate? I got answer to all these questions in my first Marathon. Yeah I participated in 2013 edition of TCS 10K with bib number 8260. After registration, the main target was to complete my race. I was least worried about my ranking and timing. Preparation for the run involved talking about it, posting and sharing my intent on Social media, controlling hard on the eating stuff which I like most, and visualizing the runners feeling, when I run with all the amazing people of Bangalore city. The actual physical training for the race was not much. Planned to do practice as hard as I could, but seldom getting time to do as decided. One night before race ate well, kept my gear ready, tied chip to my shoes and slept early. Morning got up as early and reached Sri Kanteerva Stadium by 6:15 AM for the warm up session. The race day atmosphere at Sri Kanteerva Stadium was just electric, everyone smiled at each other. The high-octane music inside the stadium, pumping heartbeat, along with actor Rahul bose, Puneet Rajkumar, brand Ambassador Maria Mutola, three time world champion to motivate runners. Everyone practicing, conversing with other runners on to make this run their best run. Number of enthusiastic people participated in all events. 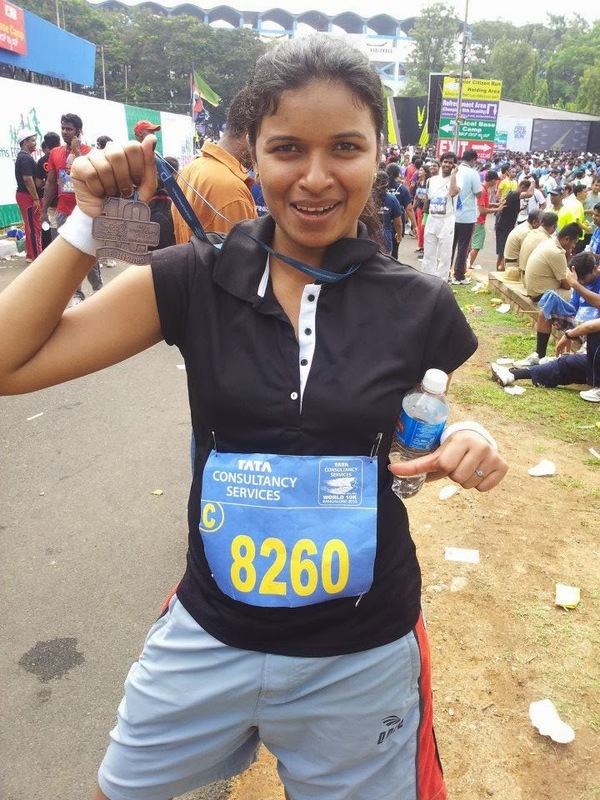 Hats off to all participants of Champions with Disability & Senior Citizen's RUN for their high morale in marathon and incredibly over 22,000 people came out to run at the TCS 10K Marathon on May 19, 2013. After warm up session, different categories of race flagged off followed by open 10k race. Young and old, fit and fat, first-timers and veterans stepped out together to run. Distance was never more when we had supporters standing entire stretch just to drive and cheer runners. Folk dance entertainment, runners performing to their music and encouraging them too. Differently abled kids, and other NGO’s running for a cause spreading message and awareness. Costumes run participants running with definitive messages to spread in society. So many people racing together, I saw it live for the first time. People waited long enough to read each other’s' placards. The experience of running with more than 10K people was worth the sweat. Other than the actual run, the causes for which people were running for were really splendid. There were best of the best messages during ‘Majja run’. First half of the race was more or less smooth. As it became little tougher, the other participants kept cheering each other to keep running till the end point. Finally I finished it in 01:28:49 sec, not a great timing but a beginning. This is not the end; it encouraged me to bring the best out of me, next time. Yes I will come back and am running all over again. The feeling when I crossed the finish line, that’s the best feeling I had and I know how it feels like because YO! I am a FINISHER.